welcome to the 12 Days of Christmas 2016 Day 6! Today I am guest designing over at Gerda Steiner Designs! 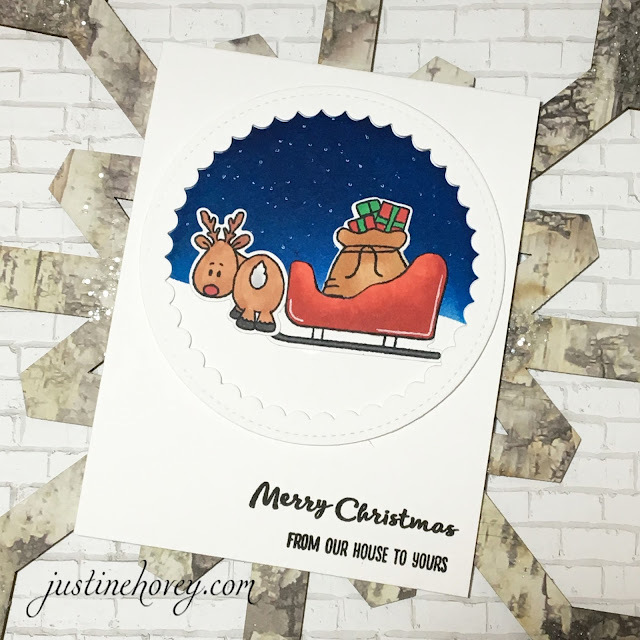 Today, I am featuring the Up on the Housetop stamp and die set to create this adorable scene! Don't forget, if you're dying for more videos right away, you can refresh your memories with the 2015 and 2014 series or the other videos for the series that I have published so far in 2016. I'm giving away the Sportsy Santa stamp set and dies! A big thank you to GSD stamps! Thanks for watching! I will be Guest Designing on November 19th for GSD Stamps as well so be sure to pick up the stamp set so you can play along too! Hi Justine! I love the cute card and simple coloring, too. Thank you for a chance to win! You won't be sorry...I just splurged and I love mine. Great card. Love Gerta Stein designs. My Christmas wish is for a Copic airbrush system. Awesome card. If I could have anything.I would like more storage or a table I could stand at. What a cute card, I love the night sky you've created. The one thing I would love for Christmas would be the MISTI.. what a great tool to have. Thanks for all the great cards & inspiration. Hi J. Gorgeous card! I would love to have more Copics and their refill and a larger case to carry them! I am enjoying your style of cardmaking very much. Tfs! Great card! This stamp set is adorable. I think if I could have anything I'd go for a brother scan 'n cut! I love the scene you created with this cute stamp set. If I could receive anything crafty for Christmas it would be a Brother Scan 'n Cut. Super cute card and awesome video. If I could have something for Christmas I would like a big shot. Thanks for sharing and an awesome giveaway. How cute!!! I loved this card and the quick coloring making the scene. My wish for Christmas would be the Brother scan n Cut. Thanks so much for the chance to win!! These are the cutest Santa images! Thanks for sharing your adorable reindeer card! Great card! A crafty item I would love is either the brothers scan and cut or the silohuette cameo 3. 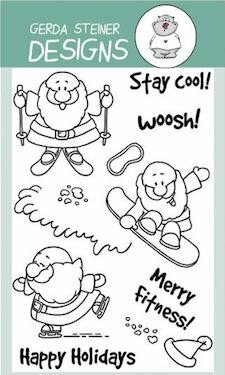 Very cute card, wow your ink pads were juicy, mine seem a little dry, better get some re-inkers....that's what is on my wish list. Just a delightful card!! I would love some alcohol markers! Adorable card. I will now always think of Max the reindeer, when I look at this set! For Christmas, I would like some storage shelving and some Pretty Pink Posh sequin mixes! Love your card! I'm going to try a night sky!! I would love cabinets and shelves for Chriistmas!! Super cute card! My Christmas wish would be a set of Zig Clean brush pens, thanks! I really enjoy your video's! If I could ask for one crafty Christmas gift, I would love for Santa to bring me a Brother Scan n Cut 2. Cute!! If I could have anything for Christmas I would ask for a set of Copic markers. This card is adorable! The GSD critters are so cute. They are perfect for Copic coloring. TFS and for a chance to win. I haven't made a single card for the holidays yet.....this would definitely put me in the mood! Love your videos, the card is so cute! If I could have any crafty items it would be a room with a window & lots of shelves........ couldn't decide which one would be more important.... lol! Maybe someday! If i could have any craft item, i think i want all the copic makers. WoW! Love your night sky. I think for Christmas I would love the Spotsy Santa,:-) I love Santa year around. If not I'm thinking of splurging on Copic or Zig markers. Thank you for opportunity to win. I would like a Brother cut and scan! !